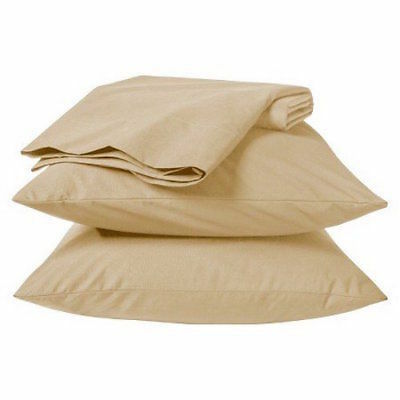 Top-Rated Sellerwordsoundpower consistently earns high ratings from buyers thanks to fast shipping and excellent service. 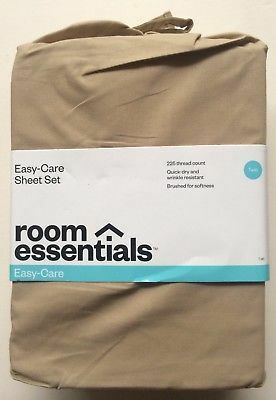 Room Essentials Easy Care Sheet Set Twin Size Color: Tan Includes: Flat Sheet: 66" x 96" Fitted Sheet: 39" x 75" x 13" Standard Pillowcase: 20" x 30" Fits Mattresses Up To 15" Deep Fully Elastic Fitted Sheet Fiber: 60% Cotton / 40% Polyester 225 Thread Count Care: Machine Wash. Tumble Dry Brand New Sealed We Ship Fast! Will Combine Orders To Save On Shipping Please View Our Other Rare Items *Note* Please Ask All Questions Before Bidding (Combined Shipping Totals Included) Thank You So Much!